Listen LIVE every Wednesday from 4-5 PM CST for the BLISS BREAKDOWN show. LFL MVP? Bliss RB ChrisDell Harris Is A Female Version Of Adrian Peterson. As all great players learn, bumps must come before success. Chicago Bliss running back ChrisDell Harris and the team suffered a tough 2012 season, but 2013 has brought new light for both Harris and her team. Through two weeks the Bliss are 1-1 and more importantly ChrisDell Harris also know as "Ferrari" has put on a showcase which includes a four touchdown performance against the Las Vegas Sin. Her six touchdowns in two games has not only put defenses in check but the entire LFL on notice. Her aggressive run style is forceful and mixed with speed and great field vision, Harris makes it tough for any defense who tries to stop her. Harris has an extensive background in running which can be credited to her track experience while with Nike and even back in college at Western Illinois. As a Fighting Leatherneck Harris set a WIU record in the indoor 60 meter run and ranks in the top 10 for four other indoor runs, as well as the top 10 in three outdoor runs. A multi-talented athlete Harris also has been in talks with the WNBA, Chicago Sky, and even European basketball teams are interested in obtaining their own Ferrari. Harris runs like a female version of Adrian Peterson and has taken the ups and downs that even Peterson has. A bright light, the spotlight, has followed the very athletic woman as she competes in track and LFL with her sights set on the basketball court next? If her 2013 performance continues, the Chicago Bliss running back may have another feature in common with Peterson and that is the honor of earning an MVP trophy. 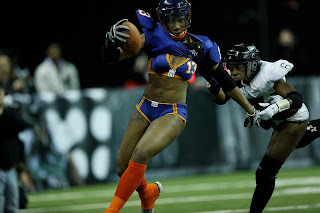 It was a game in which came with a lot of hype, the Las Vegas Sin were playing their first game of the 2013 season, and the Chicago Bliss were playing in their last home game of the 2013 season. Not much changed from last game for the Bliss to begin as running back Chrisdell Harris took one of what would turn into a four touchdown performance in to give the Bliss an early lead. "Ferrari" Harris looked more like a female-Adrian Peterson out there as and early turnover by Vegas turned into another Harris touchdown. Vegas finally answered with their own score when Carmen Bourseau plowed into the end-zone, but the Bliss weren't done scoring in the first half. Rookie Alli Alberts, who took a devastating blow against the LA Temptation proved her words "I wanted to show game 1 was a fluke" and did just that when she made a very athletic catch off the pass from quarterback, Heather "Rockstar" Furr. Much Ado About Nothing for the Sin in the second half as the Bliss and "Ferrari" Harris came out and scored the third and fourth touchdowns on a night of her epic performance. Bourseau, who seemed to the most consistent and ready-to-perform player for the Sin came out and put up her second and her team's final score of the night. Coming into the season expecting a lot of production in the option offense, Coach Hac said "we made the decision to let Chrisdell take over games, and she showed us it was the right call tonight". Furr added her own comments saying "Chrisdell was great, if we continue to have this consistency and chemistry, we'll be tough to beat." Rockstar Furr told the Las Vegas Sin to "watch out" after their loss to the LA Temptation, so after this win what does she have to say for her opponents in Green Bay and Minnesota? "Well, I guess, watch out. They'll have this film to look at and prepare on, but we'll be ready." Following the heart-breaking loss against the L.A. Temptation, Chicago Bliss quarterback Heather Furr said the Sin "better watch out". The Bliss are a hungry, violent, and physical football team and they may have the upper hand going into this matchup against the Sin, who will be playing their season opener. Offense: The Bliss will need to run the option successfully to get Furr and running-back Chrisdell Harris going together on offense. After the loss, Furr said her relationship with Harris will be key to go into this game against the Sin. Running the option with their two veteran leaders will be the plan the Bliss must follow if they plan on securing the win. Defense: While the Sin have an advantage with game film to watch and prepare on, the Bliss have something much more valuable, and that's season experience. For Chicago, they must key on Sin wide receiver Cassandra Strickland who had 9 receptions, 131 yards and 3 touchdowns in the 2012 season. The option offense and passing defense will be the keys for the Chicago Bliss to win this game. Game happens on Friday, May 10, 2013 at the Sears Centre Arena. The Bliss are favored by 5.5 and the over/under total is 58. Predicition: Bliss 42 vs Sin 17.
writer of the LFL, Kevin Fay. Fay talked to us about Crush QB Tia Knipper and the future of the team with new head coach Dontez Howard. We also talked with Chicago Bliss wide receiver Laura "Stickz" Petersen about the upcoming game against the Las Vegas Sin. We had two special callers who called in to talk about some coaching tirades in the LFL and the coaching mentality when coaching women sports. It was a wild scene in the Sears Centre Friday night as the Chicago Bliss opened the 2013 season against the Los Angeles Temptation. There was a sense of joy and relief throughout the arena following the wake of all the chaos in Boston. The arena even played Sweet Caroline right before kickoff. After the opening introductions were over it was time to kickoff the 2013 season. The action got started after Bliss running back Chrisdell Harris took it up the middle and scored the first touchdown of the Bliss' season. Quickly responded by Ashley Salerno's rushing touchdown, but turnovers were costly. The game was chippy throughout as there were several scuffles that partook during the game. Quarterback Heather Furr was great in this game, yet it was two mistakes, a fumbled option pitch and an interception that proved to be the factors between winning and losing. Chrisdell Harris did score two touchdowns during the game, giving Bliss fans plenty to look forward to for the upcoming 2013 season. After the game Furr said "once Chrisdell and I get back on the same page that we had during practices and the off-season, we'll be fine." The game MVP was Chloe Butler of the LA Temptation as she scored her first touchdown of the season. The Chicago Bliss' next game will be at home May 10th against the Las Vegas Sin, while the Temptation will be in Seattle to take on the Mist on May 4th. New here to SportsTownChicago.com is the Bliss Breakdown, a new show with a focus on the LFL, Legends Football League, formerly known as the Lingerie Football League. The Bliss Breakdown takes a central focus on the Chicago Bliss team of the LFL, and for the premiere show Pete Ferreri, Mike Pendleton, Torino Brooks, and Leo Bienaime preview the 2013 season opener against the 2012 LFL champion LA Temptation. Included in the show, Coach Keith Hac calls in and not only previews the upcoming game vs LA but also what it's like to coach women's football, and some of the planning it takes to coach in the LFL. The Bliss will feature their star, Heather Furr who plays both quarterback and safety in this seven-on-seven women's football league, and the team plans to use her and running back Chrisdell Harris in an option style offense, in which the plan is to catch the Tempation off guard. All that and more was discussed in our first show, and here's a short mix of our conversation with Coach Hac. Stay tuned here as we will have a game recap after the game. Welcome to your home for all the information and news for YOUR Chicago Bliss. Tune in every Wednesday LIVE on SportsTownChicago.com for the Bliss Breakdown from 4-5 PM CST. 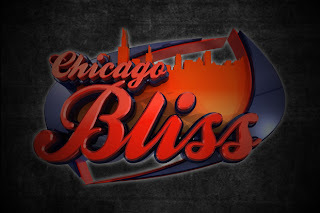 Also follow our Twitter and Facebook as Mike Pendleton will be reporting LIVE for the Chicago Bliss. If interested in being a broadcaster, go to beonair.com or call 630.916.1700 for more information on the Illinois Center for Broadcasting.